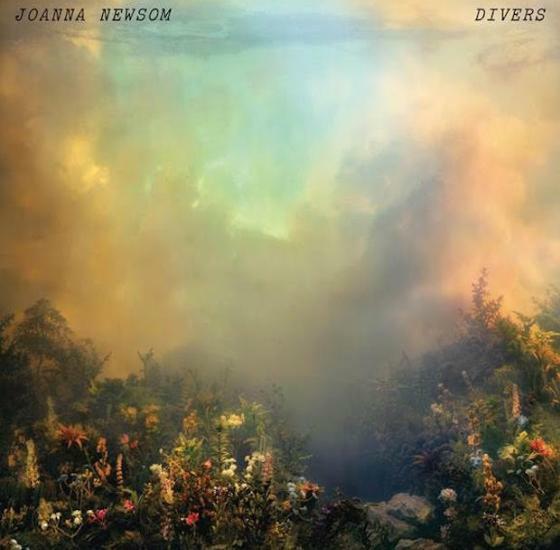 "Stand brave life-liver, living out your days in the river of time," Joanna Newsom sings on Divers' closer 'Time As A Symptom', as she laments how new places, new experiences and new loves, can so often surpass our memories of those that came before. Newsom's music has always felt fascinated by time, and by how our own personal experiences of lived time are nested within more massive scales that elude our full comprehension — from the erosion of human memory across the span of a single life, to the fading ruins of centuries of history, to the unfathomable near-infinity of cosmic time. The title of her 2006 masterwork Ys referred to the mythical French city that according to legend was swallowed up by the sea, while its follow-up Have One On Me touched on related ideas, tracing the full emotional arc of a relationship from birth to death. While embryonic compared to its successors, even the lyrics to her debut The Milk-Eyed Mender seemed to telescope time, threading the arcane and archaic through the fabric of modern life in subtly incongruous ways — something akin to walking along a high-street where multinational coffee chains and Apple Stores sit alongside herbal apothecaries and alchemist's shopfronts. These preoccupations have heightened further still on Divers. Here her lyrics are all stitched tightly together by numerous references to the drift of memory, time's passing, and the impossibility of retrieving what has been lost. 'Goose Eggs' contemplates migration and lives lived in transit ("the loneliness of geese who never find their peace"), and 'You Will Not Take My Heart Alive' the gradual receding of the present into the past ("Now the towns and forests, highways and plains, fall back in circles like an emptying drain"). Newsom's lyrics have always played tricks with scale — the stories she told on Ys were made ultra-vivid by the way they'd suddenly zoom in to capture microscopic sensory details, such as the skipped stones and mica-spangled mudclouds of 'Emily'. On Divers these details are even more integral to the fabric of her songs, reshaping them around the narrator in curious, dreamlike ways: the "telescope ruins" of 'Waltz Of The 101st Lightborne' in which she discovers her wounded lover possess the hyperreal character of one of Borges' nightmarish cities, and later, as the title track reaches its peak, she suddenly frames an image of "motes of sand dislodged" that's left etched into the mind as if by photographic flash. What's truly impressive about Divers is the sheer scale of some of these lyrical time-space distortions. First single 'Sapokanikan' draws on Shelley's poem Ozymandias and indigenous American histories to stage a riveting meditation on colonisation, power and memory, whose timescales swoop from the immediate to the centuries-deep in the space of a heartbeat. Set in New York — once the site of the Native American village of Sapokanikan — and her lyrics paint a picture of past violences leaking from the walls and the ground to infuse the present. Layering loss upon loss, the song's reflection on indigenous struggles against colonising powers and the erasure of those traumatic histories, also feels resonant at a time of heightened political tensions around migration, and the impacts of human activities upon our planetary life support systems. Jared Diamond's 2005 book Collapse also quoted Ozymandias while discussing human societies, including canonical examples such as the people of Easter Island, that appear to have collapsed due to the extreme pressure they placed on limited environmental resources. At 'Sapokanikan''s close, the music rushes upward in a harmony-fuelled rush that feels like abruptly zooming out to a satellite's-eye-view, to witness a future hunter stumbling across the ruins of present day New York, and "see[ing] with wonder the tributes we have left to rust in the parks". All things will some day be lost, it seems to say, but if we do not acknowledge and learn from the tragedies of the past, we are doomed to reenact them. Yet although Newsom's thematic matter has become broader in scope, as if in mirror-image her songs themselves have become far more compact. Divers almost entirely eschews verse-chorus structures for fluid, riverlike arrangements whose overlapping twists and turns and dizzying upward trajectories mirror their free-flowing storylines. In a recent interview with the New York Times, Newsom revealed that she'd been working on this record throughout the five years since its predecessor. That level of effort is most evident in these songs' density and complexity, with many — the surging 'You Will Not Take My Heart Alive', the majestically sad 'A Pin-Light Bent' — packing all the drama and emotional intensity of Ys' 10-minute-plus epics into 5- or 6-minutes that bristle with ideas. In interviews around the time of 2012's Bish Bosch, Scott Walker described his compositional approach as a process of "dressing" his lyrics, of employing whatever raw materials necessary to make visceral their tangled storylines and surreal asides. Compared to Walker's grotesque-concrète Divers' instrumentation remains firmly in the realms of the conventional — her harp and piano are still at the fore — but the album overall achieves a similar effect. These songs draw her widest timbral and textural pallette to date into arrangements that form dynamic, evolving stage sets around her lyrics. Changes in the narrator's perspective, or relocations in time and place, are often accompanied by sudden shifts in rhythm or instrumentation — snakelike ripples of harp notes on 'You Will Not Take My Heart Alive'; the firey blasts of electric guitar that come burning through 'Leaving The City', hinting at long-distance travel through desolate places; the implict suggestion of a massed group of voices joining in on 'Sapokanikan''s interlude song of "Do you love me? / Will you remember?" As with Walker's late music, the results are songs with the effect of completely immersive, living and breathing worlds, each with their own internal logics, dynamics and (often bent) laws of physics. It's a pleasure to be allowed to wander through them — and none more so than the title track 'Divers' itself, where an underwater world's cool synthetic glow is pinpricked by harp notes that catch like sunlight on the ocean surface. Space appears to distort as the song's story of distant love progresses, with the narrator sinking ever-further from the sun's glow amid torrents of piano and woodwind, until finally she dissolves into pure sensation, lost entirely to the passing of time.